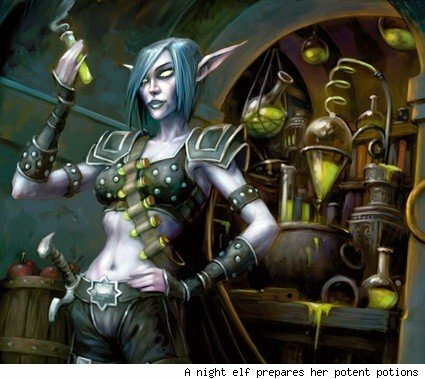 Alchemy is one of the more versatile professions in WoW, for two reasons. On the one hand, you have the option of transmutating at higher levels, which is low risk and big profit, and on the other hand, you can list potions, elixirs & flasks on the Auction House which will net you a slow and steady income. From the MMO-C Alchemy preview, we've been able to pick up some info regarding the state of flasks in the upcoming expansion. You'll be able to benefit to your guild's raiding experience with the new Cauldron of Battle, recipe obtained at Guild Level 5, basically gives each of your raid members a flask buff appropriate to their class/specialization. There are now not one, but two metal transmutations coming in Cataclysm. You'll be able to transmute Pyrium from Elementium, and you'll be able to transmute Truegold from Pyrium, which with the expected early state of the market in Cataclysm, you'll be able to have a very low risk and very big profit from transmuting these bars. Hoh, boy! This specialization of Alchemy has certainly taken a left turn in Cataclysm, though it may not offer as high profit than Transmutation Specialization, and not as much cash flow from Elixir Specialization (flasks) It's certainly worth checking out! For example, there's now a "Potion of Treasure Finding", potions for literally every stat offering short term boosts for approx. 4x the flask bonus, illusion potions, hell, even a teleportation potion that sends you to Deepholm! I personally love how they're reintroducing some of the fun concepts we saw in Alchemy back in Vanilla, and are now using to make Alchemy fun and profitable again in Cataclysm. Enough chit chat. Let's see what we need to get Alchemy up and running from 450-525 in no time! The mats you're going to require are fairly simple, but if you lack Herbalism as your gathering profession you may need to spend a fair bit on the Auction House to obtain what you need. 30 Whiptail - Herb, found in Tol'Barad, Uldum. 30 Nightstone - Prospected from unknown nodes. There are of course other routes to getting to 525 Alchemy, this is the route I'll be taking on release, though.